Our first Artcasting research team ‘deep day’ took place on Wednesday 27th May. Some of the team were new to the idea of the ‘deep day’ so Chris (Speed) took charge of the whiteboard and gave us an insight into the creative and collaborative working ways of Design Informatics at Edinburgh College of Art. The day started with feedback from our individual mini-projects. Jen reviewed a survey that a gallery visitor might typically be asked to complete after an exhibition visit. Reviewing the survey generated discussion around the purpose(s) of the questions asked and the data that might be generated. 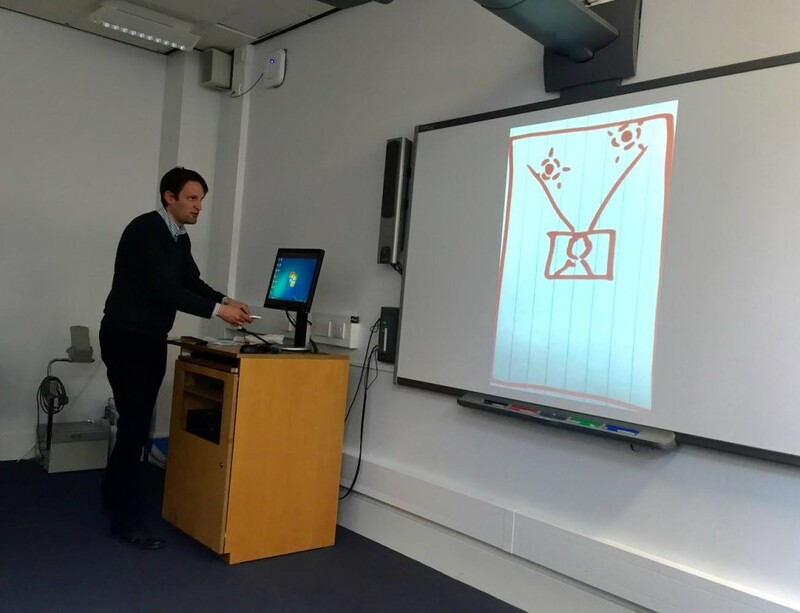 Jeremy, who had been thinking about embodiment and the mobile phone, presented a review of gestures people might make with their phones in cultural spaces – including the fidget, the quick draw and the holster. This lead to a discussion of acceptable and unacceptable behavior (and tacit knowledge) in cultural sector settings. Chris (Barker) and I both took different approaches toward thinking about museum and gallery engagement in our mini-projects. In addition, I provided an overview of some contemporary debates around the subject of arts evaluation: the social impact of the arts (intrinsic and instrumental, public and private), the use of quality/impact frameworks and associated methods of evaluation that predominately favour the production of quantitative data. One of the highlights of the day included a ‘Pop-Prototyping on Paper’ exercise to design and bring to life our imagined versions of the Artcasting app. Though our apps differed in content, and clearly Chris Barker (Developer) had the edge on the design front, the process generated lots of ideas (too many?) about content and functionality. We came away with a list of questions we hope our target audience (of 13-25 year olds) will help us to answer during workshops taking place in July.